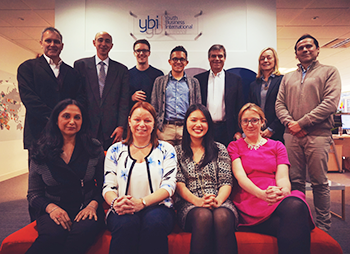 The Department of Leadership, Work and Organisations (LWO) and the Centre for Enterprise and Economic Development Research (CEEDR) at Middlesex University have secured a global research project with Youth Business International (YBI). It will evaluate how volunteer business mentoring assists young entrepreneurs, both in terms of their business start-up and development as well as their personal growth and entrepreneurial journey, and will inform the YBI Global Growth Strategy. Six academics from LWO and CEEDR make up the core research team, including Principal Investigating Officer Dr Julie Haddock-Millar (pictured front row, second from the left with the rest of her team and representatives from YBI). "We are delighted to be partnering with YBI," said Dr Haddock-Millar. "The project is of great importance to the YBI network and wider stakeholders. Its impact will be far reaching both in terms of research excellence and broader impacts to economies, society and policy. The application process was highly competitive; the team were thrilled with the feedback, particularly that our proposal was 'outstanding'." Commencing in January 2016, the project is expected to run until at least mid-2017. As part of its commitment, the Middlesex team will present at next year's YBI global summit in Brazil, which will be attended by delegates from more than 40 countries.